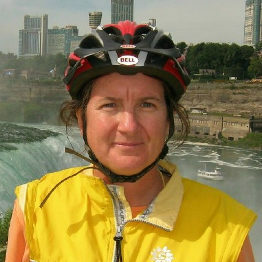 Patricia Kovacs is a life-long Ohio cyclist, retired from Alcatel-Lucent Bell Laboratories where she worked as a telecommunications software engineer. Tricia has a BS in Engineering Science from University of Cincinnati and a MS in Computer Science from Ohio State University. Tricia serves on the Gahanna bicycle advisory committee, where she authored the school travel plans for Gahanna’s Safe Routes to School program, and developed Gahanna’s signed shared route system. Tricia also serves the Ohio Bicycle Federation in motorist and law enforcement education, bicycle crash analysis and assisting in the legislative initiatives of OBF. Tricia teaches bike education to adults and children in the Columbus area, working with others to overcome fear of the roads by creating a better cycling environment through motorist bicycle awareness and through cyclist confidence.